On August 13th, we are going to celebrate our 2nd Year Tasty Tuesday Anniversary Hop. We are going to have a FUN contest and our friends from Zuke’s Treats is sponsoring it. 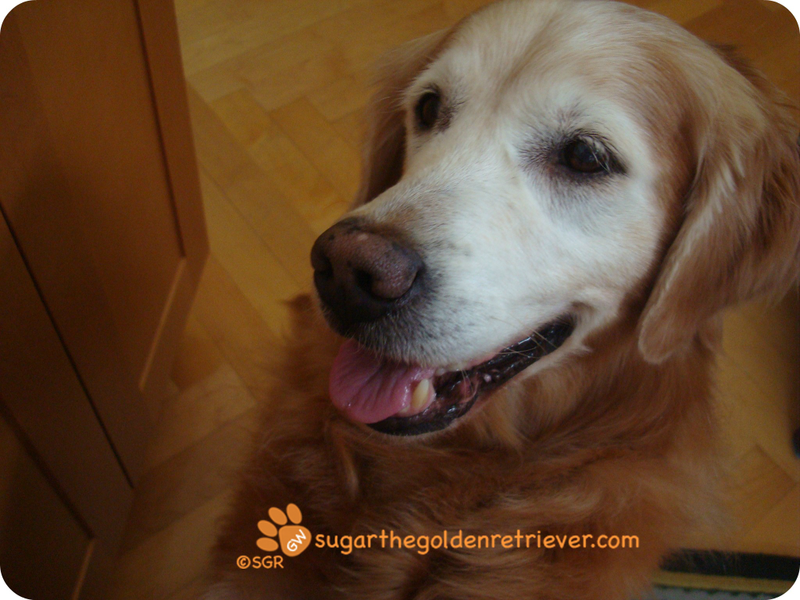 I regularly consume Zuke’s Hip Action Treats, I Golden LOVE it. 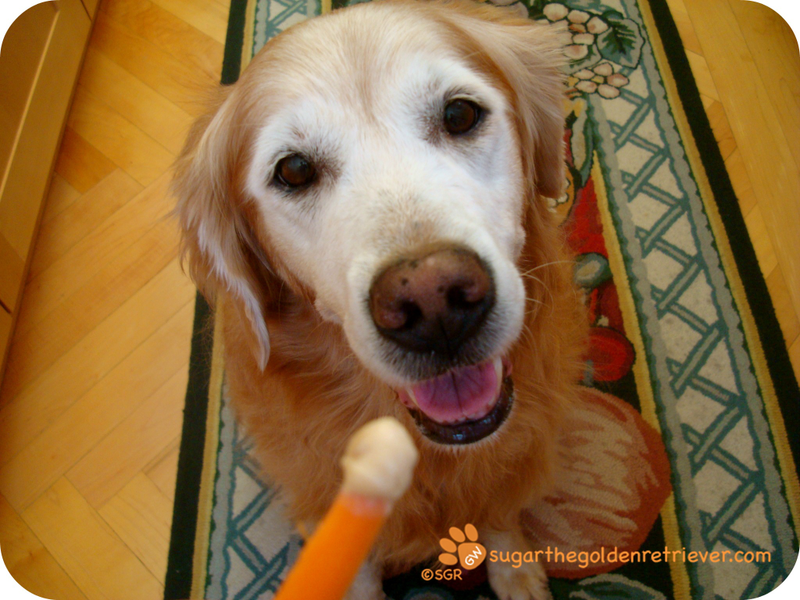 Zuke’s Treats is known for their healthy natural ingredients and proudly made in the USA. 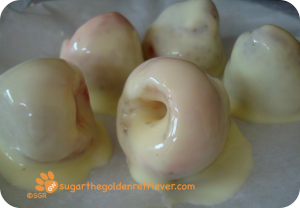 1) You can post a recipe: bake/frozen or in any manner (be creative) with “Fruit” as the secret ingredient. It means that you can use any fruit. 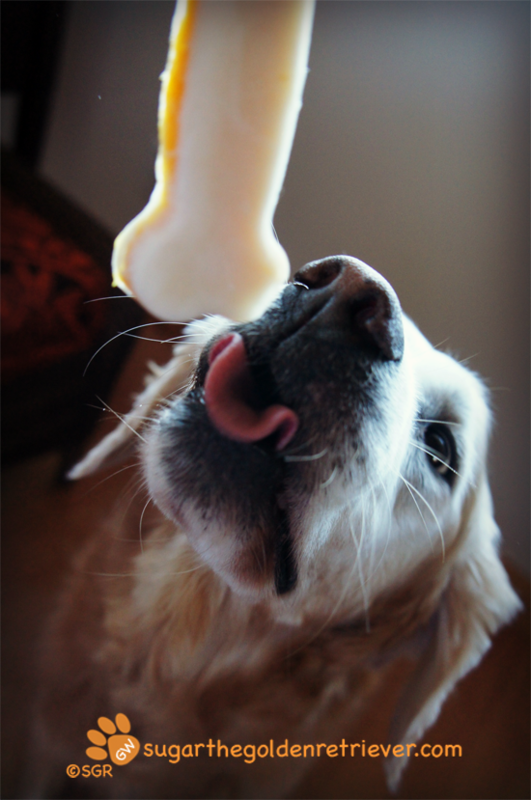 2) Post a photo/video of What Your Dog Will Do For A Treat? Again, be creative. This contest is open to all our blogging friends and non-blogging friends. If you are a regular reader of my blog, you know how much I enjoy bananas. My mom made me some Frosty Banana Over A Banana. Frosty Banana = Blended Yogurt and Banana. Mom used a mini banana ice mold she found in Target. 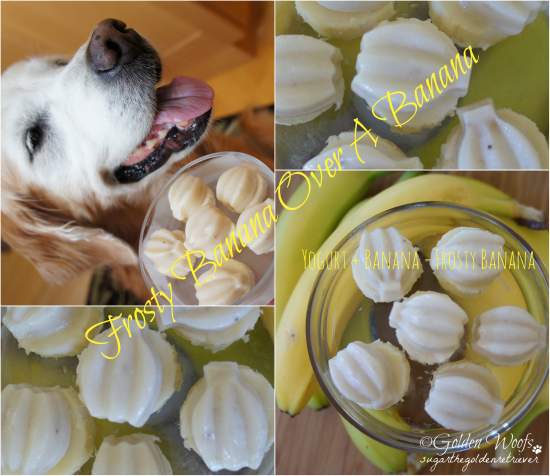 She cut small pieces of bananas (optional to freeze) and placed a Frosty Banana on top. 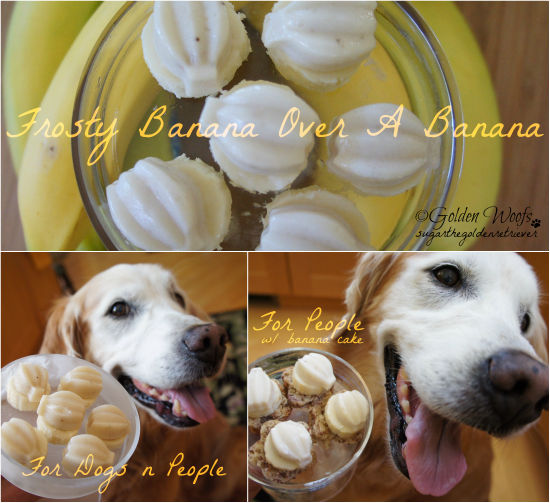 Frosty Banana Over A Banana is a Tasty DELISH Treat that both you and your dog can enjoy. Mom’s version (for people only) smells delicious. She baked mini banana cake. I would do anything to have a banana. I’ve posted a video last February balancing a small Hawaiian Apple Banana. I was able to Balance 5 Apple Bananas. The mainland bananas are much larger and I was able to balance 3 bananas on my head. 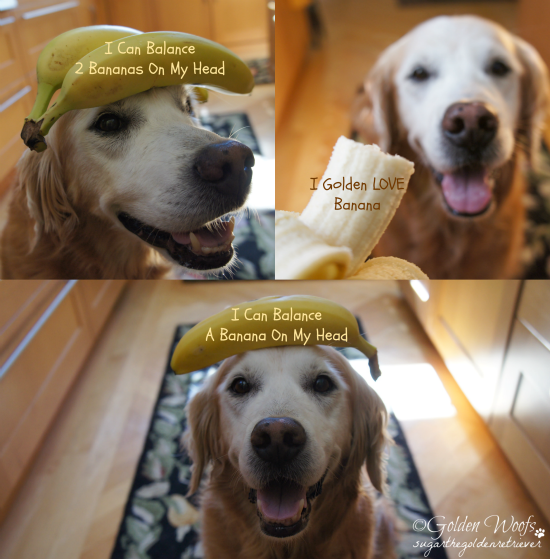 Sugar Balances 1,2,3 Bananas from Golden Woofs on Vimeo. As always, Golden LOVE to hear your comments on our recipe and video. We hope everyone can join us on our 2nd Year Tasty Tuesday Anniversary Hop. Last week Tasty Tuesday we shared a tutorial on how to Roast a Pumpkin. It’s a very easy process and hope you gave it a try. 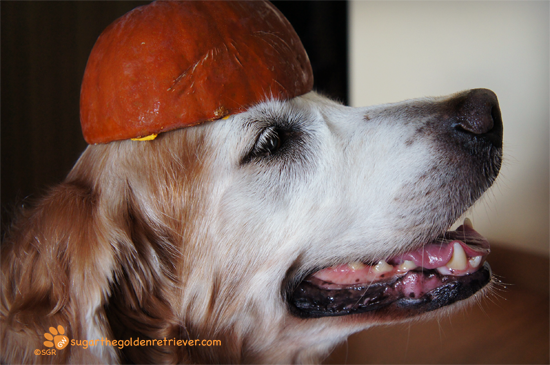 If you missed the 4 easy steps of Roasting a Pumpkin, click here. What did my mom do with the roasted pumpkin? She made some pumpkin soup for dinner. Of course she did not forget about me. Tasty! YUM! Delish! and so pretty too. 1) Pour some yogurt in the mold, Freeze it for an hour. 2) Add the roasted pumpkin on top of the frozen yogurt. 3) Add another layer of yogurt. Freeze it for an hour (or longer). 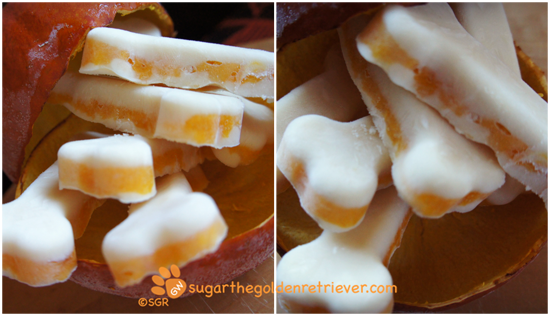 A great October Halloween treat that your dog can enjoy and yourself too. My mom saved the pumpkin skin and froze it. She used it as a bowl to keep my Layered Pumpkin Frosty Bones. She also thought of something amusing to do with it after all the treats were gone. Last week, Jan 24th was National Peanut Butter Day. To celebrate mom made a Peanut Butter treat that both of us can enjoy. This dip was so easy to make. Just mix Peanut Butter and Yogurt. 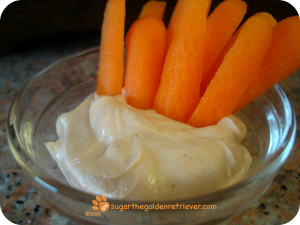 We dipped some carrots but apples and bananas are great pairing for this dip. 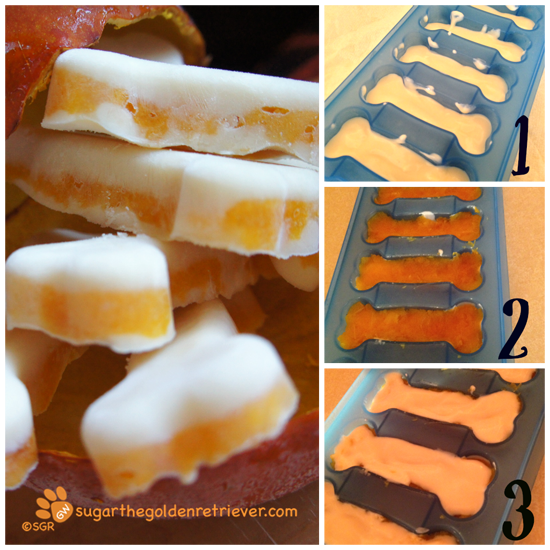 This Peanut Butter Dip is a DELISH Tasty Treat that both you and your dog can enjoy together. Don’t forget to grab the Hop’s Badge and post it along with your blog post. Hop’s Badge is located on the right side bar bottom on my blog. Mom made a dessert that both of us can enjoy. She got this idea from Pinterest and made some modifications. Place a banana and plain yogurt in a blender. For a better consistency, freeze it for a couple minutes. Dip the strawberries. Place the dipped strawberries on a parchment paper. Freeze it for an hour. 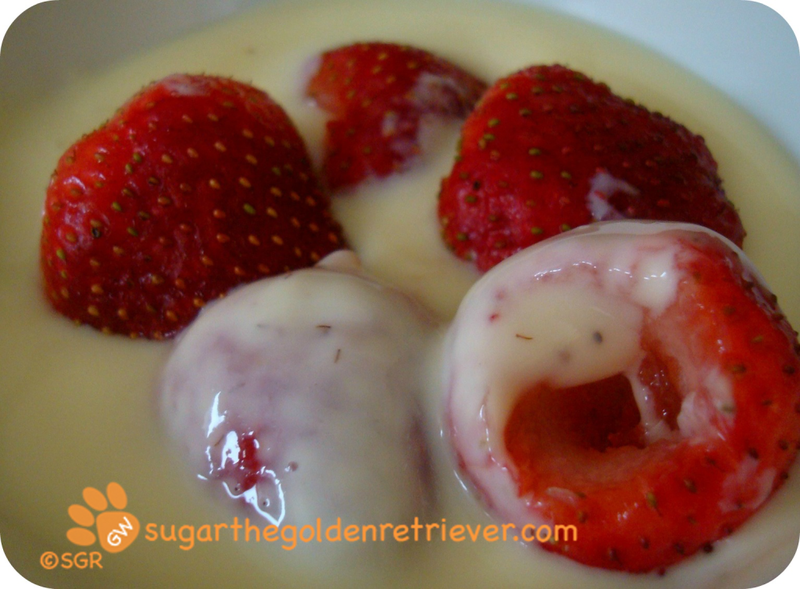 Optional: After freezing for an hour, you can re-dip the dipped strawberries for a thicker coating. Ooops! Got super excited to taste it and ate it all … forgot to take final photos. To post the Blog Hop Code with your blog post,Click Here.